You can also choose Yogurt. 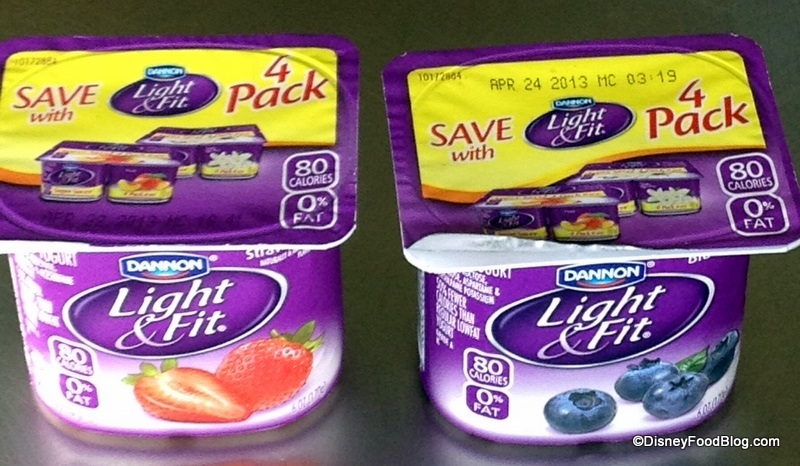 The standard Dannon Light & Fit in a variety of flavors is available in 6-ounce portions. But the real star of the menu is the Egg and Cheese English Muffin Breakfast Sandwich. You can choose your meat here — either bacon or sausage. Now, the price may seem a little high when compared to your standard fast food breakfast. But consider this: the sandwich is a double decker version, with the twice the meat and egg of your normal Egg McMuffin. At least it was on MY visit! Personally, I think that makes a difference. A sandwich this substantial will keep you going all morning long! They also offer a few pastries, including a danish and this enormous Cinnamon Roll, which we sampled. And you know, it was fine. 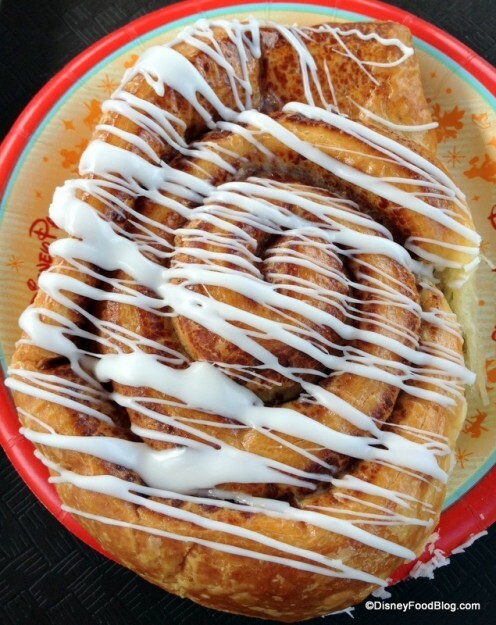 But you know me — I’m all about the frosting on a cinnamon roll. 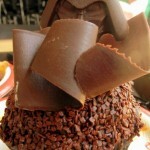 And this little drizzle on top didn’t really cut it. Add to it that there really wasn’t much of that ooey gooey cinnamony wonderfulness in the middle of the twists of dough, and you have a somewhat disappointed AJ. That said, the taste was good, and I was surprised by the moistness of the roll. No way is this standing in for other superior cinnamon rolls, like the maple-flavored one at Gaston’s, or the (may it rest in peace) Main Street Bakery’s version. But it’ll do in a pinch! Plus, it’s definitely big enough to share or save some for later. When you don’t want procuring the day’s first meal to interfere with getting your Toy Story Mania FastPass, then Fairfax Fare is a great option. 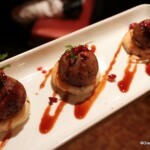 While the breakfast menu isn’t extensive, they certainly offer something for just about everyone. Cereal or pastries, fruit or yogurt, even a breakfast sandwich — you’ll find them all here. And these are eats that you can down quickly, or even in many cases consume while en route to your next stop. 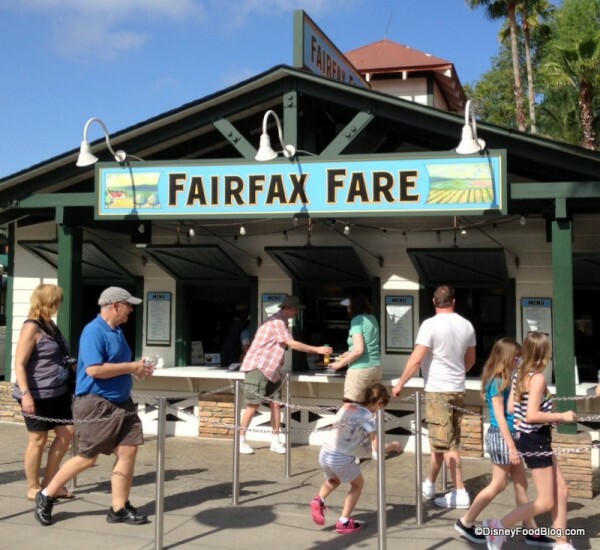 Have you grabbed breakfast at Fairfax Fare? Let us know what you thought of their menu in comments! Hi AJ thank you for the review. 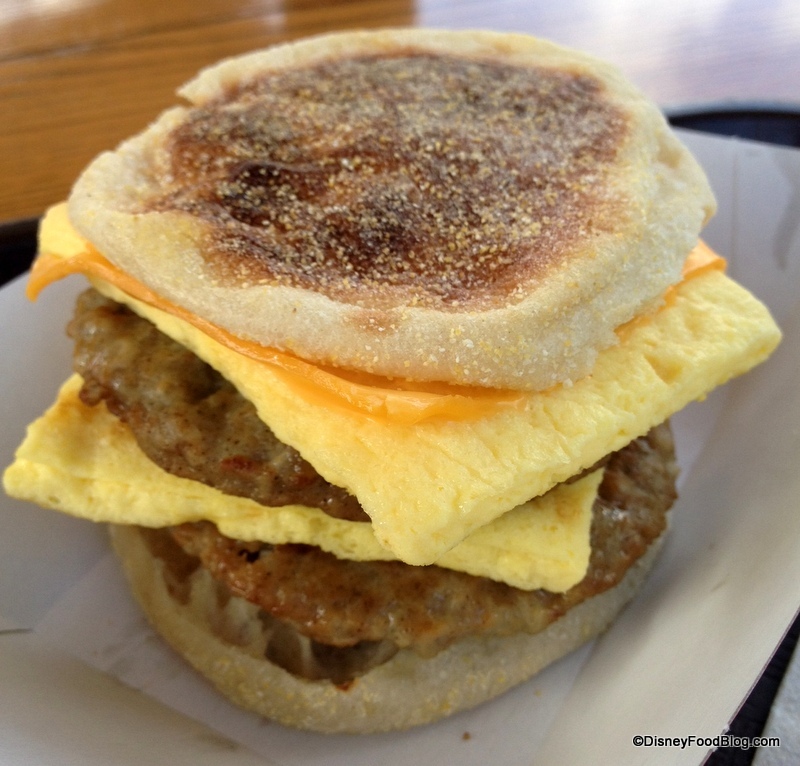 I was wondering are you able to ask for just one egg and one sausage on the egg and sausage English muffin? It looked really good to me but to much food. I was impressed by the size! It looks like enough for my husband! 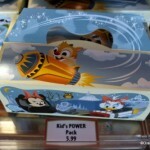 Geez, if you folks really think that is a lot of food, I WISH I could go to Disney and have your food budget. I was going to comment on how the limited menu and small amount of food didn’t seem worth stopping there, but I guess others feel differently. Breakfast is my favorite meal of the day, and I don’t think I’d be happy having only one hot item to choose from. I’ll stick with the other parks for my breakfast needs. If you’re like me and think 2 sausage patties might be overkill on this sandwich, here’s a tip: grab a large, buttery croissant from Starring Rolls for the extra egg and sausage patty (and someone to share it with). If you’re sharing, though, a word of caution: there’s only 1 slice of cheese so you’ll have to fight for it. Personally, I don’t think it’s as good when they used to put the egg and sausage on a bagel, but it sure does hit the spot. Wish I was there! Essie, I don’t remember the maple flavoring so I must have not noticed it, but while the cinnamon rolls at Gaston’s are good, they still aren’t as awesome as the ones from Main Street Bakery. I’m still bummed about that change. I’ve never gotten a double decker here and I’ve had breakfast here a few times. I don’t think it’s the norm, unless they changed it recently. In fact, they have always been pretty skimpy on the bacon. For me. But maybe not anymore? Hm. 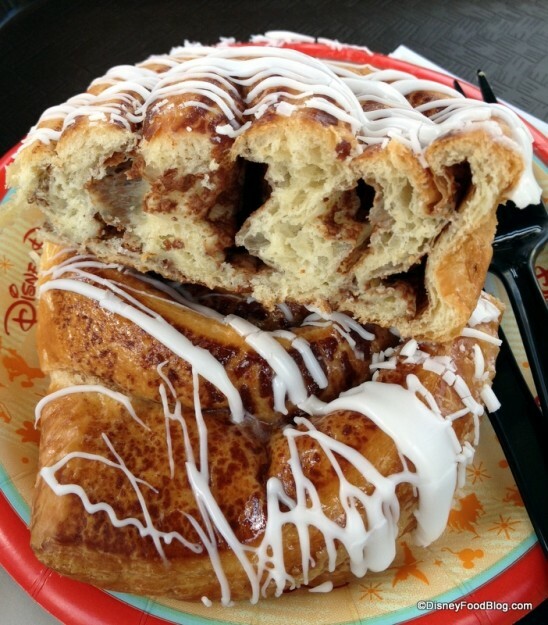 The glaze on the cinnamon rolls at Gaston’s is exactly the same product as the Main St Bakery’s version. 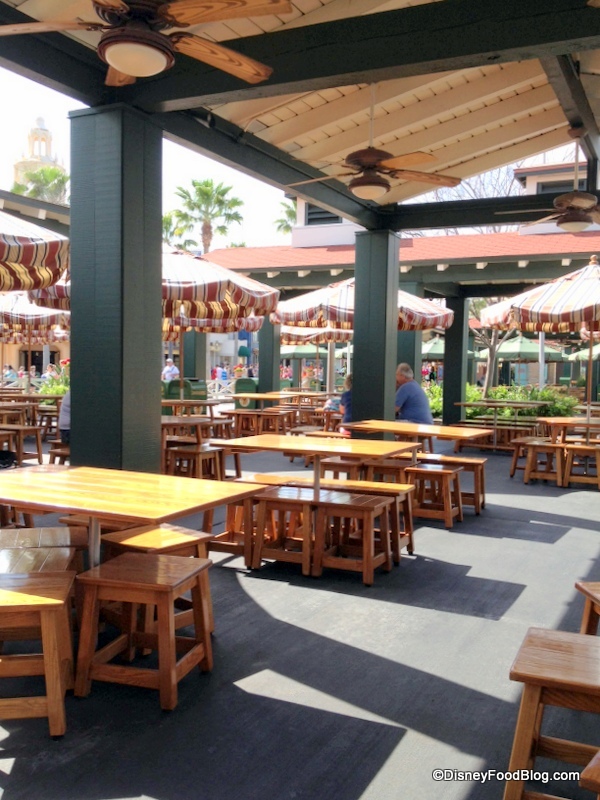 From October until the bakery closed, the cinnamon buns sold at Gaston’s were baked and glazed at Main Street. Same exact stuff. 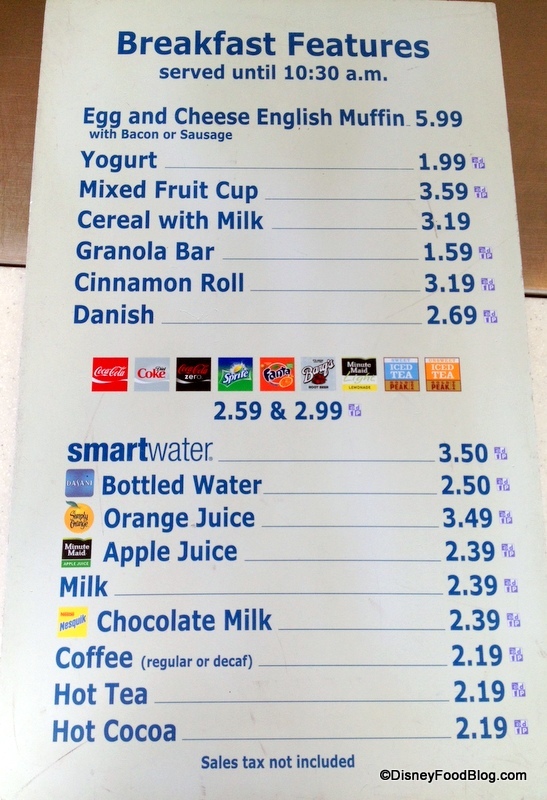 I really wish places at Disney would offer the option of plain yogurt or ever regular sweetened yogurt instead of the vile “lite” stuff. I love yogurt but can’t and won’t eat aspartame. I agree about the light yogurt. 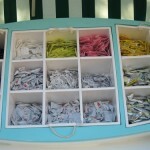 I am another person who will not eat the artificial sweeteners. I have the same issue with the lemonade they sell. It would be nice to have regular lemonade for a non soda option. Maybe they’ll get with the Greek yogurt trend, which is low fat but feels and tastes like “regular” yogurt. With all the calories, salt and fat I’m going to eat later in the day and every day on my vacation, for breakfast I’d want a banana and yogurt. Good to know I can grab them here! 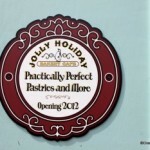 I thought the new main street bakery brought back the cinnamon role? Did they not? I make these at home as I don’t care for overcooked eggs. 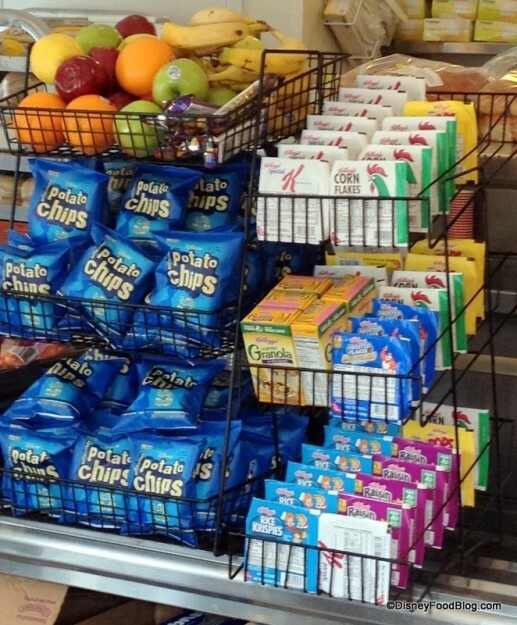 The eggs in the picture remind me of McDonald’s – way too done. But the double meat – great. Ancient thread, I know, but I wanted t mention that the breakfast muffin was doubled just like the picture when I had one last Saturday.